Play around with the colors until you find what you like. Personally, I like the Black Background with Yellow or Green Text. Another good scheme for old school geeks is a Green Background with Black Text. Although the top of this How-To answers the question about color, let me show you the next two things I always change when logging into a new Windows Machine for the first time – CMD Window Size, Buffer, and Copy/Paste Edit Options. 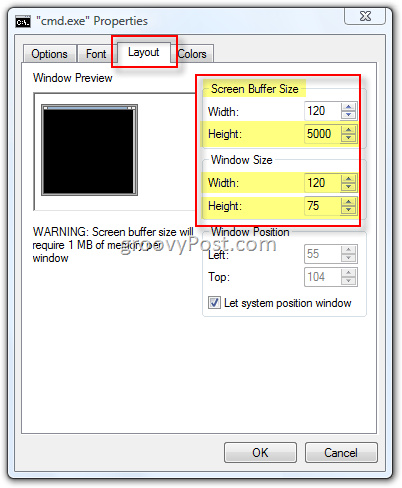 Screen Buffer Size – A larger buffer size allows you to scroll up and look through data which scrolls off the screen in your CMD Window. This larger buffer size is VERY useful ALL the time when working in the CMD Window/Shell. Windows Size – Not much to explain here. These numbers work for me (19 inch Monitor running 1600 x 1200.) Play with the size until you find what works for you. 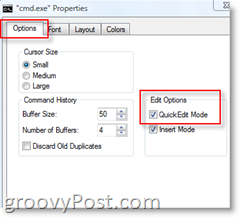 The QuickEdit mode will save you a LOT of time if you need to copy and paste text from both inside and out of the CMD Window. 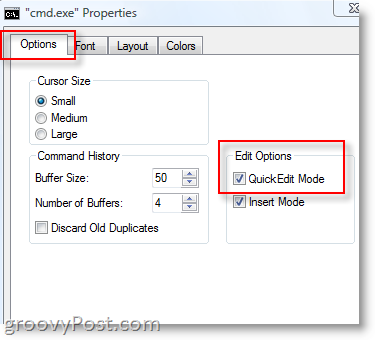 For example, to COPY Text to your Clipboard from INSIDE the CMD Window, using your mouse Hold down your Left Mouse button and Drag/Drop some text. After you highlight all the text you want to copy, release the mouse button and Right-Click your Mouse to copy the text to your Clipboard. PASTE the text inside your CMD Window now by just Right Clicking (CTRL-V does not work inside the CMD Window.) 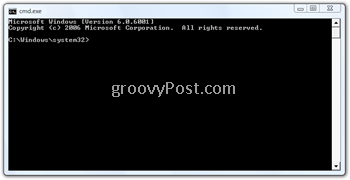 You can also Paste the text inside a text editor like Word or Notepad using Right-Click Paste or CTRL-V.
Again, for Old School Geeks, this is an old Trick. BUT, I’m amazed how many times I’m asked: “How did you do that with Co-Workers looking over your shoulder?” So there ya go! WOW and AWE your Co-Workers/Wife and Children! 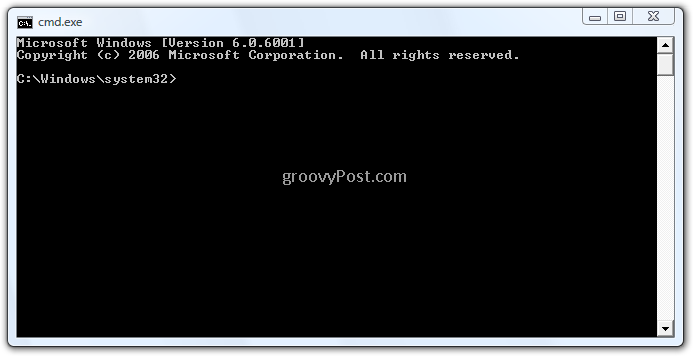 You’re now a Certified Command Line <groovy> Geek! Never knew any of this. Awesome screen shots. Thanks! I was wandering whether you can change all the settings you’ve mentioned via command line and not only via “left click — properties”. Do you happen to know the commands ? @AshkA – good question. 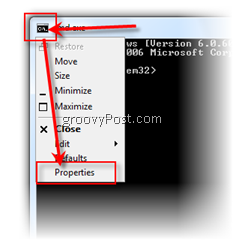 I’ve actually never looked into it before but, when doing a cmd.exe /? in a command line you get a lot of options. 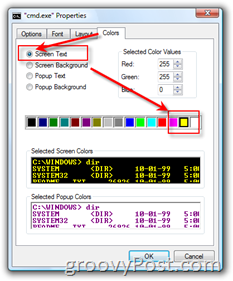 I do know you can change the colors easily by using 2 methods. Either by typing in Color FC (will make a white background and Red Text – Type Color /? for details) or by typing cmd /t:fc which will also turn it the same red/white combo. which is blocking your web pages content has these links,Facebook-email-rss-tweet youtube on a banner banner strip ?